Yokogawa Electric Corporation (TOKYO: 6841) announces that it has developed the TDLS8100 probe type tunable diode laser spectrometer and will release it for sale on January 23 as part of its OpreX™ Analyzer family. 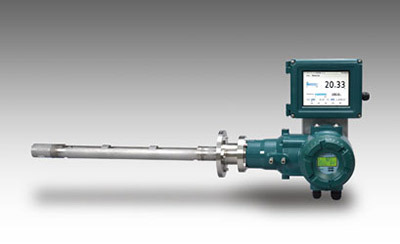 The TDLS8100 is targeted at applications in the oil, petrochemical, power, iron and steel, and other industries that require the ability to directly measure oxygen or carbon monoxide gas concentration at high speeds. With its integrated light launcher and detector, this new probe type tunable diode laser spectrometer significantly reduces the need for the installation of flanges*1 and scaffolding, and thus enables a 50% or greater reduction in installation costs. The TDLS8100 joins a lineup that includes the TDLS8000 tunable diode laser spectrometer for high-temperature and high-pressure gas concentration measurement applications, and is intended for use in the measurement of flowing gases where there is a need to reduce installation costs. With the addition of the TDLS8100, Yokogawa will be able to provide its customers a greater range of choices on solutions that can help them ensure safe operations and maximize energy efficiency. 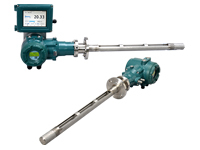 Within the first half of this year, Yokogawa plans also to release a TDLS8100 model for the measurement of ammonia and hydrogen chloride gas concentrations. Gas analyzers are used in plants to obtain data on oxygen and carbon monoxide gas concentrations that are needed to optimize the air-fuel ratio, thereby reducing energy consumption and helping to ensure safety and compliance with environmental regulations. Various types of gas analyzers are in use today, including zirconia, infrared, paramagnetic, and laser gas analyzers. Laser gas analyzers can directly measure at high speeds the concentrations of gases such as oxygen, carbon monoxide, carbon dioxide, and ammonia that are absorbed in the near-infrared region. Such instruments do not require sampling systems and achieve superior repeatability*2 and linearity*3. However, such analyzers are costly to install due to the requirement to mount flanges for the light launcher and detector on both side of the ducts, and the need to install scaffolding to access both locations. With the development of the TDLS8100, Yokogawa has enabled a 50% or greater reduction in these installation costs. With a conventional gas analyzer, support flanges for the light launcher and detector sections must be installed on both sides of the duct. For this installation work and the performance of routine maintenance, permanent scaffolding must be erected. In addition, temporary scaffolding must be put up so that a special cable connecting the light launcher and detector can be installed. The cost of installing such gas analyzers can thus range from several million yen to as high as 10 million yen*4. As the TDLS8100 comes with an integrated light launcher and detector, the flange and scaffolding only need to be installed on one side of the duct, reducing installation costs by 50% or more. This also eliminates the need to periodically perform*5 cumbersome and time-consuming maintenance procedures such as optical axis adjustment that are required with transmitted light detectors that use separate light launcher and detector. Just like the TDLS8000, the TDLS8100 uses the spectrum area method to calculate the gas concentration from the area in a light absorption distribution chart. Stable measurements are thus achieved even in environments where the gas pressure and temperature fluctuate and other types of gas and large amounts of dust are present. Although the TDLS8100 is a probe type instrument, it is able thanks to the design of its optical components to maintain a stable laser optical axis and light path length (length of transmission of laser light through a measurement sample) for long periods of time. The TDLS8100 is certified to the IECEx explosion proof standard. Application for TIIS in Japan, FM in the United Sates, FM in Canada, and other certifications are pending. Yokogawa's laser gas analyzers use a method called tunable diode laser spectroscopy (TDLS) to detect the gas concentration. They offer superior real-time performance because they are installed on ducts and do not require a sampling system, so they can measure the concentration directly at high speed. They use a spectrum area method that calculates the gas concentration from the area in a light absorption distribution chart, which enables stable concentration measurement even in an environment where the temperature and pressure fluctuate or where other types of gas or large amounts of dust are present. Since their release in 2008, Yokogawa's laser gas analyzers have entered wide use around the world thanks to their high reliability and superior performance in challenging environments. Yokogawa offers two models: the TDLS8000 and the TDLS8100. The TDLS8000 comes with a separate light launcher and detector and is suitable for measuring the concentration of high-temperature and high-pressure gases even in the presence of large amounts of dust, and the TDLS8100 is a new model for measuring the concentration of gases where the flow rate falls within the range of 1 to 30 meters per second. OpreX is the comprehensive brand for Yokogawa's industrial automation (IA) and control business. The OpreX name stands for excellence in the technologies and solutions that Yokogawa cultivates through the co-creation of value with its customers, and encompasses the entire range of Yokogawa's IA products, services, and solutions. This brand comprises the following five categories: OpreX Transformation, OpreX Control, OpreX Measurement, OpreX Execution, and OpreX Lifecycle. The TDLS8100 probe type tunable diode laser spectrometer is part of the OpreX Analyzers product lineup, which is aligned under the OpreX Measurement category. The OpreX Measurement category includes field equipment and systems for highly precise measurement, data collection, and analysis. *1: A part used to connect a device to a pipe, duct, etc. *2: The degree to which measurements of the same quantity under the same measurement conditions match each other.